What an amazing way to add a BURST of fun to a room! I just love the idea of painting window frames and trim. And HOW CHEAP! Remember the term window dressing? Well, there are still experts who refer to the “ART of window dressing.” They may be in the blinds and shutters business, I don’t know, but painting windows certainly adds to the creativity and artful sense of the homeowner. Hey wait! That’s YOU!! For a classically modern look consider painting the window the same color as the walls. It’s especially fantastic when done in a neutral gray or taupe; and white on white is impeccable. Go a little darker than your walls for a restful and yet still very contemporary look. There’s always the gray against yellow for something fantastic and fresh, and maybe a little shabby chic. And then, of course, there’s always the classic black, the antithesis of bright white (which I happen to love), but maybe a touch more thoughtful. Thinking of buying an older home? Does it have natural wood? Lucky you! Natural wood lends a fabulous historical feel to a home. Not in good enough shape? Then here you go! Choose a knock-out paint color and go to town! Take a look around and decide which rooms could use that CRACK OF COLOR just by painting the windows. Maybe your area needs that ever so important focal point. This could be IT! P.S. 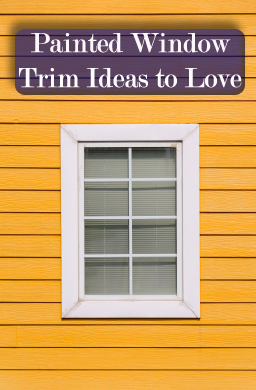 Painting trim doesn’t stop at windows you know…..
Go a little crazy and if you’re building a new house don’t let the contractor talk you out of your ideas. They do that, you know! Be bold with that baseboard ~ do darker trim than walls if that’s what you want. It will look fabulous!